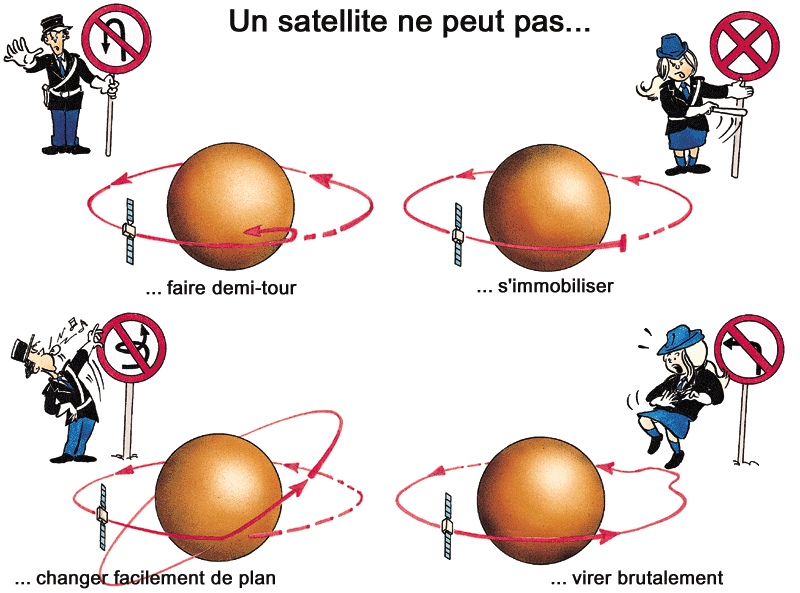 cnes | What is an orbit? Home> How space works> What is an orbit? Does a falling stone choose its path? Contrary to what we see in science fiction movies and books, a spacecraft is not free to move as it likes once it is beyond the barrier of Earth's atmosphere. It can't just turn on the spot or come to a dead stop in space. Behind its apparent tranquillity, the Earth keeps a firm hand on anything in its vicinity as a result of the force of universal gravitation to which all celestial bodies are subjected. Any object in space—be it a satellite or probe, or even a planet, comet or asteroid—is a projectile travelling at breathtaking speed on a continuous and inescapable path. This path is called its orbit. Put simply, an orbit is the sequence of positions in space of a star or artificial satellite in motion around another more massive star. An orbit’s trajectory is not random, but dictated by the laws of universal gravitation. Consider the example of an artificial satellite orbiting Earth. Its trajectory depends first of all on the velocity and direction imparted by the launch vehicle. Once the satellite is released into space, it is subjected only to the Earth’s gravity, which causes it to adopt a regular, plane-curve trajectory. It is then said to be in orbit, or gravitating, about Earth. Draw a disc on a blackboard. Fix one end of a length of fishing line to its centre with a drawing pin. Then attach a piece of chalk to the other end. If you raise the chalk above the disc and then let it go, it falls vertically. However, if you throw the chalk outwards away from the centre, it revolves around the disk and is pulled toward its centre by the line. This phenomenon is similar to the orbital motion of satellites. Gravitation is the universal force of attraction acting between all matter. Newton’s law of gravitation states that any particle of matter in the universe attracts any other with a force varying directly as the product of the masses and inversely as the square of the distance between them. The satellite moves within a specific plane passing through the centre of the Earth and containing the velocity vector imparted by the launcher. An orbit may be equatorial (in the plane of the equator), polar (passing above or near the poles) or inclined with respect to the equatorial plane. Calculus shows that the curve swept out by a satellite has to be a conic section. The exact nature of this curve depends on the velocity at which the satellite is released from the launcher, at its injection point. Once the satellite is in orbit, its velocity depends only on its altitude and not its mass, according to Galileo’s law of falling bodies, which states that all bodies in a vacuum fall in the same way. Below a certain velocity, a satellite cannot stay in orbit and will fall to the ground. There is also a velocity, called the circular orbital velocity, at which the satellite’s altitude is constant and the orbit is therefore a circle. This velocity depends on the altitude of the injection point. 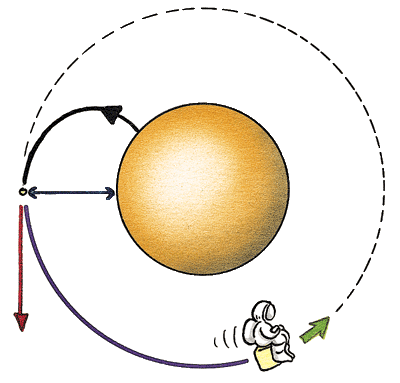 If the satellite is moving faster than the circular orbital velocity, the orbit is an ellipse. The higher the orbital velocity, the more the ellipse is elongated. The farthest point from Earth on an elliptical orbit is called the apogee, and the nearest point to the Earth is called the perigee. Velocity is inversely proportional to altitude, so it is maximum at perigee and minimum at apogee. If the orbital velocity is still higher, the ellipse gets even more elongated until it becomes an open-ended curve, called a parabola. This change occurs at a velocity called the escape velocity, beyond which the orbit becomes a hyperbola and the satellite overcomes the pull of Earth’s gravity and flies off into space. These general orbital characteristics apply to all celestial bodies. 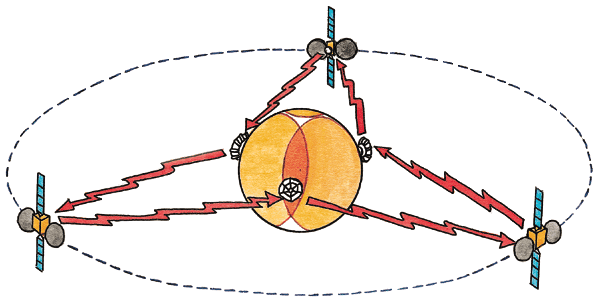 The generic terms apoapsis and periapsis designate the two points on a satellite’s orbit that are, respectively, farthest from and nearest to the body about which it is orbiting. Specific terms are used for individual bodies: if the Earth is the centre of attraction, the terms perigee and apogee are used (from the Greek, gê); if the Sun, perihelion and aphelion (from the Greek, hêlios); and by analogy, apojove and perijove for Jupiter. An orbit is an intangible curve. 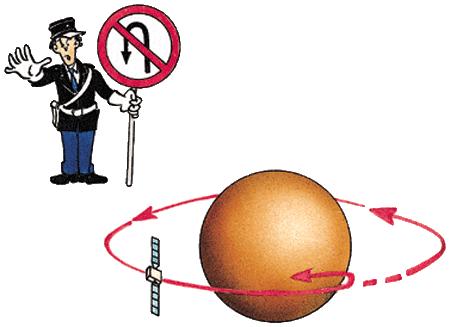 A satellite remains in perpetual motion along an invisible “path” dictated by the laws of gravity, like a captive train on a never-ending track. Another kind of virtual track, on the ground this time, represents the regions on the globe covered by a satellite. This ground track is the series of points on the Earth's surface directly beneath the satellite along its orbit. In other words, it projects the path of the satellite's motion onto the Earth. Aux points A, B et C de l'orbite correspondent les points a, b et c de la trace. Mais cette trace, en rouge sur les 2 schémas, correspond à une situation fictive où la Terre serait immobile. La trace en vert représente la trace dans le cas réel où la Terre tourne sur elle-même : la rotation vers l'est a pour effet de décaler légèrement la trace vers l'ouest. Credits: Jean-Pierre Penot (CNES) et Bernard Nicolas, illustration : Bernard Nicolas. the principles applied when projecting a spherical object (the terrestrial globe) onto a flat surface (a map). Closer examination of the ground track reveals that the orbit inclination corresponds to the extreme latitudes of the satellite’s coverage zone. So, for a geostationary satellite the track is in fact a dot on the equator. Contrary to popular belief, an orbit is not necessarily a closed, circular trajectory around the Earth. All celestial bodies obey the same principle and are subjected to gravitation: natural and artificial satellites orbit around planets; planets, comets and asteroids orbit around the Sun, and so on. 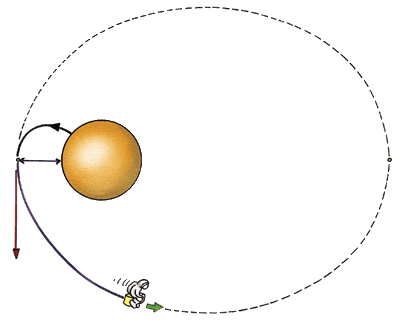 So even when a probe escapes Earth's attraction, it is still not free from gravity, since it is subjected to the pull of the Sun until it encounters another planet. A spacecraft in Earth orbit or in interplanetary space does not use an engine to keep going. Nor can it manoeuvre like a vehicle on Earth. For example, it cannot stop (if it did, it would fall back to Earth) or change direction. Any vehicle capable of travelling through space must be launched at a certain velocity. The only “engine” sustaining its momentum is therefore the gravity of other bodies it encounters on its journey. An artificial satellite does, however, possess its own means of propulsion to accelerate, decelerate or modify its trajectory while remaining within its orbital plane. It may sometimes make slight corrections to the inclination of this plane, but such manoeuvres carry a heavy penalty in terms of fuel consumption. When a geostationary satellite separates from the launcher, it still has some work to do before reaching its final orbit. The satellite’s altitude and velocity at the injection point naturally place it into an elliptical orbit with a perigee of 200 km and an apogee of about 36,000 km. It then performs at least 3 burns of its own thrusters to circularize the orbit. An Earth satellite can be placed into an infinite number of orbits. Each kind of orbit has its own specific features, and is chosen according to the mission objectives and technology constraints, such as altitude, solar illumination conditions, coverage and revisit frequency. Geostationary orbit: at an altitude of 35,786 km, a geostationary satellite appears to “hover” above the same spot on the Earth's surface. In fact, it is moving at a speed of over 10,000 kph in the equatorial plane, and completes one orbital revolution in 23 h 56 min 04 s—exactly like Earth. Because they offer vast coverage, geostationary satellites are ideal as relays for telecommunications and for keeping an eye on the weather. 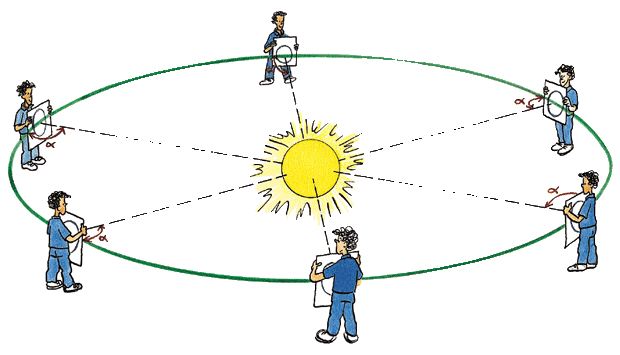 Sun-synchronous orbit: a Sun-synchronous satellite passes over the same point on Earth at the same solar time. The orbital plane is always oriented the same way with respect to the Sun. Such satellites fly at altitudes of 600 to 800 km and offer major advantages for Earth observation, since they can observe the same area of interest in similar illumination conditions on every pass. Polar orbit: a polar-orbiting satellite passes over the Earth’s poles on each orbital revolution, typically at relatively low altitude. In an orbit inclined near 90°, a satellite can cover almost all of the globe, making it very useful for Earth observation purposes.